Smart infusion pumps...an answer to medication errors? Home > Infusion pump > Smart infusion pumps…an answer to medication errors? Infusion pumps can be an important tool in decreasing medication errors. Medication errors pose a serious threat to patient safety in the US health care system. The Institute for Safe Medication Practices (ISMP) published a list of high-alert medications. Here is the list of high-alert medications. This list lists multiple IV (intravenous) medications including heparin (blood thinner), insulin (to lower blood sugar), and narcotics (for pain control). IV medications are particularly dangerous when administered improperly because of their rapid delivery into the blood. This leads to higher systemic concentrations quickly. According to the Agency for Healthcare Research and Quality (AHRQ), traditional infusion pumps are particularly vulnerable to errors because of the way they need to be programmed. It can lead to errors such as wrong dose, wrong drug, or wrong patient. See the link for additional information. To address some of these concerns, manufacturers have developed smart infusion pumps with new technology. These devices have high tech software to help decrease the medication errors associated with infusion pumps. This DERS (Drug Error Reduction System) software provides a customized drug library alerting users to predetermined minimum and maximum dose limits for each drug. “Soft” alerts prompt the user to reconsider administering a given dose, although they can still override the alert. “Hard” alerts (also known as stop alerts) theoretically prevent a user from giving a dose outside recommended parameters. If a provider overrides the soft alert recommendations, most systems record the override and who the provider was. And even hard alerts can be overridden if the provider bypasses the drug library and enters the infusion rate and volume manually. This defeats the purpose of the programming to avoid medication errors. To address the problem of giving medication to the wrong patient, some smart infusion pumps also require barcode patient verification. These are called barcode-enabled point of care (BPOC) systems. Smart infusion pumps are actually only a piece of the medication error reduction puzzle. 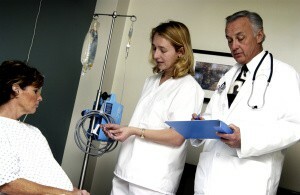 They address the problem of incorrect medication administration. However, there are many other areas where medication errors can occur including ordering, prescribing, transcribing, and monitoring patient response to medications. For that reason, the smart infusion pumps should be considered as part of an overall medication system to decrease errors. It should be connected to a system that includes CPOE (Computerized Provider Order Entry), BPOC, and electronic medication administration records (eMARs). Get additional information on the FDA website regarding infusion pump problems. The FDA is also taking steps to address problems with infusion pumps through the Infusion Pump Improvement Initiative. It has also developed a white paper dated April 2010 regarding this initiative. Who is liable if a medication error occurs with an infusion pump? There are many issues to consider in cases involving infusion pump errors. Errors can be caused by problems with the human factor, system, or manufacturer. 1) In order to evaluate whether or not the pump was defective, the device should be sequestered and examined before it is put back into service. The pumps can be “interrogated” in order to get data about what happened. The programs in the pumps can often document who the operator was, times that the pump was programmed, or if there were manual overrides of the devices safety settings. Was the device properly maintained/serviced? 2) Did the nurse using the pump have the appropriate experience and training? Was the patient appropriately monitored? Did providers override the pre-programmed settings of the infusion pump? Did the staff ignore infusion pump alarms? For more information about “alarm fatigue”, please click here. 3) Are the infusion pumps part of a system wide program for decreasing medication errors? Although smart infusion pumps certainly provide great promise in decreasing IV medication errors, they need to be part of a comprehensive medication delivery system that continues to address the human factor. Risk managers and other hospital staff are expected to take a potentially defective IV pump out of use after a patient has been harmed. The pump should be examined to see if it is malfunctioning. It is possible to “interrogate” a pump to get details of its performance. The healthcare organization may be liable if it does not provide sufficient and appropriate infusion pumps for the needs of the patients. The organization may be liable if it does not provide staff with training on how to use the pump. And lastly, the nursing staff may be liable if they do not respond to pump alarms. Jane D. Heron, RN, BSN, MBA, LNCC is a legal nurse consultant at Med League. Call us to discuss your cases involving medication errors.